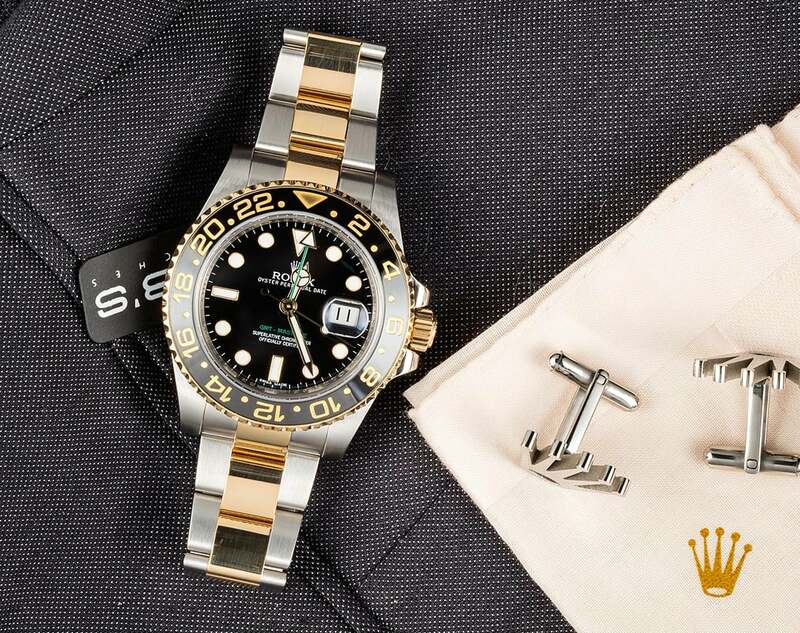 Patented in 1933, Rolesor is the term coined by Rolex for their two-toned watches where the bezel, crown, and bracelet center links are crafted in gold while the case and bracelet outer links are fashioned in steel. The combination of the two materials is a signature look of the brand, and it can be found in almost all of their collections. 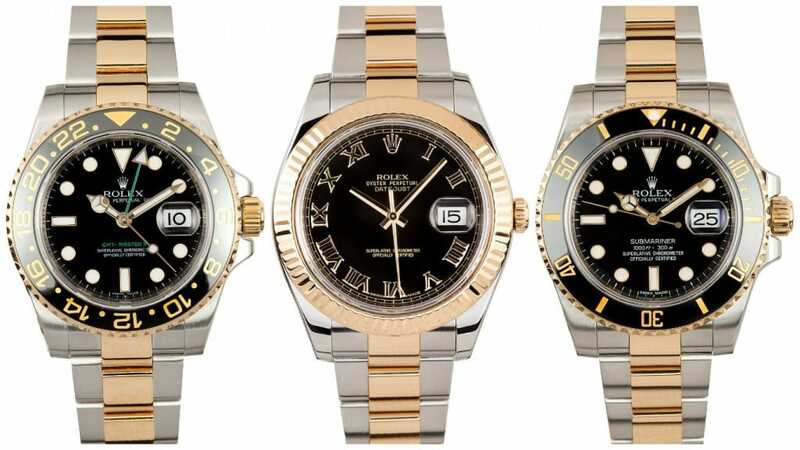 Here we present three different models, a GMT-Master II, a Submariner, and a Datejust II, each sporting the Rolesor coupled with a black dial, for a classic Rolex style. The ref. 116713 is a part of the current Rolex GMT-Master II line fully loaded with the Cerachrom scratch and fade proof ceramic bezel insert, “Maxi” dial, Triplock screw-down crown, and Rolex Caliber 3186. Both the 40mm Oyster case and the Oyster bracelet of the GMT-Master II 116713 have been updated with the case having been redesigned for a larger fit while the bracelet now has polished solid center links. The large lume plots are perfectly outlined by yellow gold, as are the characteristic Mercedes style hands. The pop of color on the black dial comes from both the green arrow tipped 24-hour hand, as well s the matching green GMT-Master II label on the dial. Aside from the Rolex 116713’s great looks, it’s also a very practical wristwatch to have – not only does it tell the wearer the time and date, it can also keep track of three different time zones thanks to the GMT-hand and rotatable bezel. 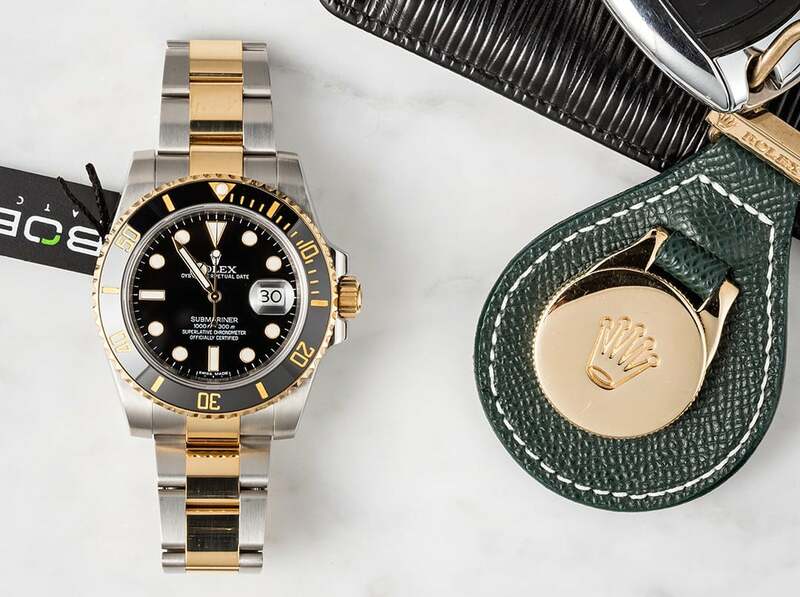 First unveiled in 2009, the Rolex Submariner 116613 is the latest two-toned Sub offering from Rolex and is available in both a black dial and black bezel configuration, in addition to a blue dial and blue bezel one. This specific black dial and matching bezel combo is particularly striking against the yellow gold and stainless steel mix of the 40mm Oyster case and Oyster bracelet. The Cerachrom diver’s bezel with a black ceramic insert is highly resistant to scratching and fading and is engraved with large numerals and graduations coated in gold. As a diving watch, the ref. 116613 can safely submerge to a depth of 1,000 feet and for optimal legibility underwater, the Chromalight display provides illumination in the dark for up to eight hours. A Two-Toned Rolex Submariner ref. 11613 is a popular watch. 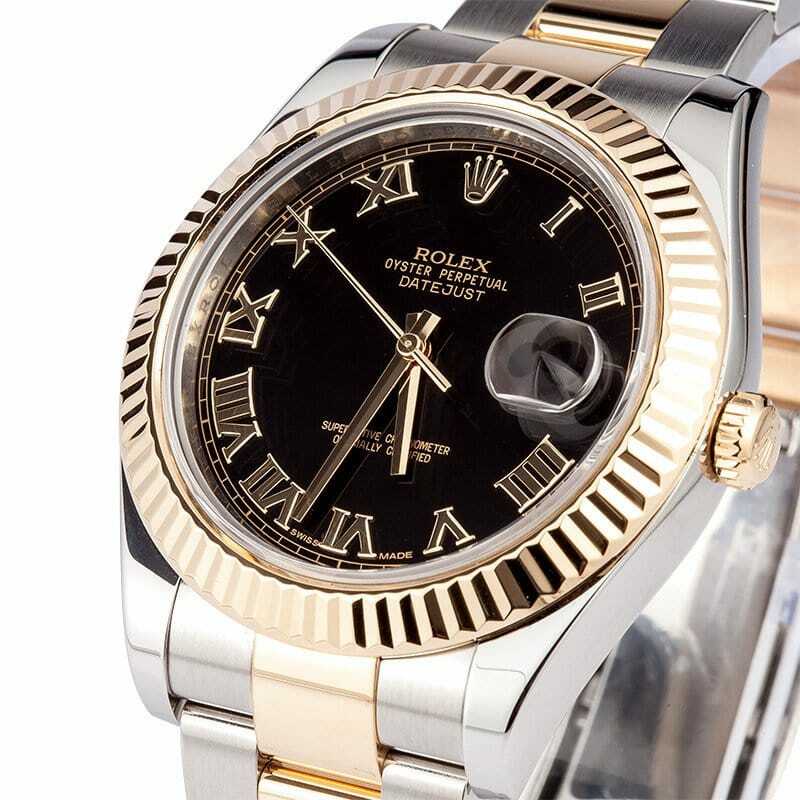 The Rolex Datejust II collection is a larger version of the Datejust line with its watches sized at 41mm. The Datejust II 116333 belongs to the current Rolex collection and features many of the design elements that are so characteristic to the classic Rolex watch. The 18k yellow gold fluted bezel sits atop the stainless steel Oyster case and frames a black dial with gold Roman numerals and gold center hands. At the 3 o’clock position sits the date window, powered by the automatic in-house Caliber 3136 and magnified by the Cyclops lens affixed to the sapphire crystal. On the Rolesor bracelet, the center links are constructed from 18k yellow gold bordered by the 904L stainless steel outer links for a look that is so iconic to Rolex. Datejust II 116333 is a wonderful luxury watch.